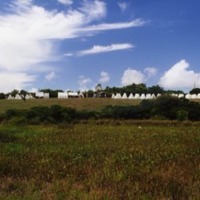 A photograph of an encampment created by re-enactors located at Teddy Roosevelt Park in Montauk Point, New York. 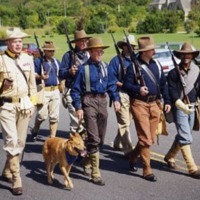 A photograph of Rough Riders impersonators marching in formation while holding rifles. The men are wearing blue jackets, leggings, and brown-rimmed hats. The photograph was taken at Montauk Point, New York. 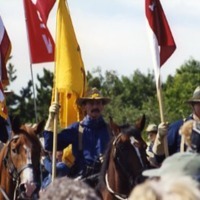 A photograph of Rough Riders impersonators standing at attention holding rifles. 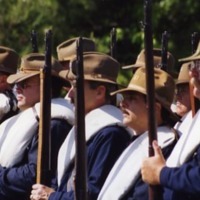 The men are wearing blue jackets and brown-rimmed hats. 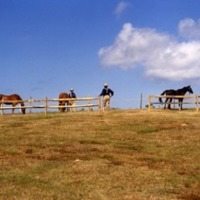 The photograph was taken at Montauk Point, New York.